I can't believe it's taken me so long to get this written! Sorry I've been torturing my loyal readers for over a year. But if you think that was bad, get this: I told no one in my family, other than my very discreet sister, that I was going to Africa until about 3 days before I left. 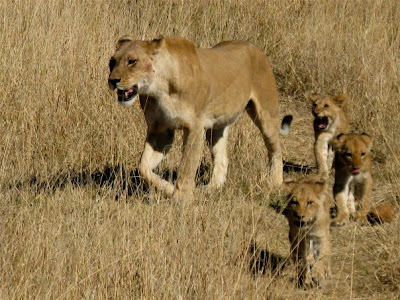 My parents tend to be worriers, and I didn't want them to be spending more time than necessary thinking I would a) catch malaria or worse; b) get caught up in Zimbabwean refugee violence or other political turmoil; or c) be chomped on by a lion. In the end, my dad was the more paranoid one, shuddering at the idea of having to be evacuated to a hospital in Johannesburg. My mother, on the other hand, who worries I'll be mugged in broad daylight in NYC, was thrilled to hear I'd be doing a safari and rhapsodized about me following my dreams, living life to the fullest, yada yada... which is actually no surprise when you consider my parents' financial personalities! So, long ago, I'd alluded to the possibility of traveling with some friends. I'd said a safari was one of those possibilities but I'd initially written it off as being too expensive. After thinking about it more, and thinking about that year's budget, I changed my mind. I didn't know when else I'd have a chance to do this kind of group tour with friends, and I am not a sociable enough person that I wanted to risk being trapped for 2 weeks in the middle of nowhere with total strangers! So I gritted my teeth, signed myself up, and started bleeding money! The initial $500 deposit was just a drop in the bucket! Perhaps if I'd been exploring this on my own, I would have picked one of the cheaper tours that other people I know have been on. But the friends I was going with had used our tour company before and were used to a certain level of travel comfort I guess. And I was okay with that for a trip like this-- I'll explain more about that below. Included in the tour cost was one internal chartered flight, other transport by boat and bus, all game park entry fees, all accommodation and all food and drink except for a couple nights in lodges where some drinks weren't included. All this, for a 13-day trip, came to $5,960. I shared a car to the airport with one of my friends-- I think that was about $40. Then there was the airfare-- I had to buy a round trip ticket between New York and Johannesburg, plus one-way flights from Johannesburg to Maun, Botswana on the way there, and from Victoria Falls to Johannesburg on the way back. The total for airfares was about $2,400. We had to stay one night in a hotel at the Johannesburg airport before continuing to Botswana the next morning. We stayed in a lovely and convenient place for $152 including the cost of round trip van service to the terminal. If you're going to southern Africa, it's recommended that you get shots for yellow fever and hepatitis, as well as a typhoid vaccine and polio booster. (If you've had these before, you may not need them again.) Malaria pills are also recommended. 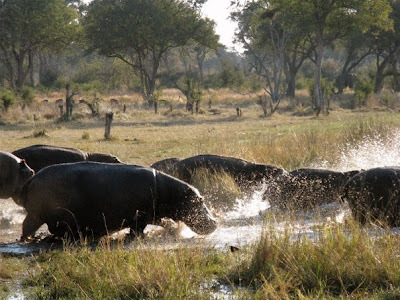 There were no bugs whatsoever at that time of year in Botswana and we weren't doing any swimming, so the actual risk of infection was quite low, but to me, that just isn't something you want to mess around with. I spent $175 on doctor visits and shots, and $125 on medications. Travel medicine is not cheap, and insurance doesn't tend to cover it, though you can claim these expenses against a healthcare FSA. But the good news is that most of this was a one-time expense that won't be needed again the next time I take an exotic vacation to some disease hotspot of the world! It's customary to tip the trip leaders and the camp staff. The tour company suggests amounts of about $100-125 for the trip leader, $80-100 for the assistant trip leader, and $80-100 to be split among the other crew members. The tip amounts seemed like a lot to me at first, but for the length of the trip and the level of service, I ended up feeling like they were justified. We pooled all the tips from our group and then gave them out, so if anyone had wanted to put in a different amount, they wouldn't have had to feel self-conscious about it. These costs weren't strictly for this trip alone, but I bought some of those packing organizers , which are indispensable when your luggage is a giant duffle bag. I also bought a pair of binoculars, and a few months before the trip, a new camera. Also, I paid $3 for a SmartCarte at JFK (so annoying, as other airports around the world have free carts.) And I spent about $150 on gifts for people back home. So what was the trip like? Well, in a word it was fabulous. If you'd asked me a few years ago, I would never have said I would do such a trip. I'm not that big an animal lover, and Africa wasn't at the top of list of places I wanted to visit. But this trip was like nothing else I'd ever done and I can sincerely say it was an amazing experience. There's something about being in such a remote place with wild animals all around you-- it's just glorious. I think part of the reason it's taken me so long to write this post is that I found it hard to put in words how I felt about it. I don't think this kind of safari trip is for everyone, though. You spend a lot of time driving around on bumpy, dusty, unpaved roads. We spent most nights in tents, and even when we were in lodges, which felt quite luxurious, the amenities are still simple, and there are often limits on hot water and electricity use. Even the lodges have mosquito netting and canvas for parts of their walls, and July was winter in Botswana-- temperatures in the tents were sometimes in the high 40s (Fahrenheit) overnight! If you're into camping, you'd find it quite easy going-- I'm totally NOT into camping and I still found it very comfortable. You don't have to carry your bags anywhere, the tents are spacious and equipped with cots and battery-powered lamps and shelves for your stuff. Your laundry will be done for you and the staff bring you hot water for a wash basin in the morning, and for a shower in the late afternoon. Each tent has its own bathroom area in the back, with a toilet seat over a pit and shower. The grossness of a pit toilet is greatly made up for by the gloriousness of using it under the spectacular stars and moon at night! Every morning we'd have coffee and breakfast around the campfire. Lunch would be a picnic most days, usually in a scenic spot with animals grazing not far away. Dinner was in a big dining room tent, or, if it was really cold, we'd move the table out of the tent and onto the dirt so we could have piles of hot coals under our seats to keep us warm! The food was amazing: the cook made everything using pans over an open fire or a dutch oven buried in the coals, and she managed to produce all kinds of fabulous roast meats, stews, soups, homemade breads and cakes and muffins, all of it delicious. At first some of us were a little leery of some of the salad-y items, given the typical recommendation against eating any vegetables that might have been washed in iffy water-- but they used a tank of purified water for everything, and I don't think anyone got the least bit sick. Alcohol was abundantly served, and sometimes we'd even stop for sunset drinks out in the vehicles or even on boats. I had no idea we would eat so well. The food and the level of service in the camping were a big part of the expense. It's key to point out that we were a group of ten guests. The staff were two guides, the cook, and at least 3 or 4 other crew at any given time. 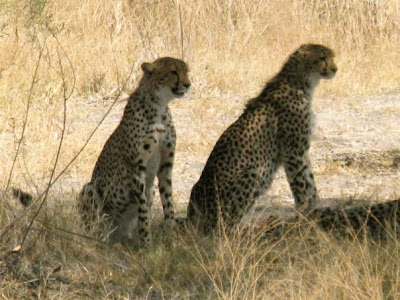 On our game drives, there would be 5 guests and one guide in each vehicle so there was a lot of personal attention. The guides got to know everyone and what they were most interested in, and if someone wanted a particular camera angle for a photo, they'd make it happen. After encountering other groups of 10 or 20 or more people packed into oversized trucks, I started to really appreciate the small, personal scale of our trip. 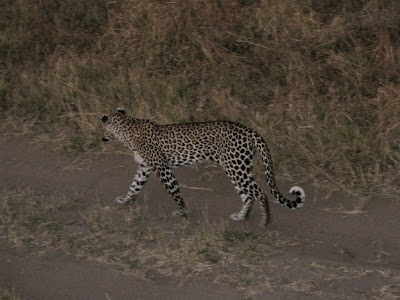 We were on no schedule but our own, so if we wanted to stay out a bit later to chase down a leopard, we could... and did! If there was any drawback to this trip, it was that there was very little "cultural" component-- it's really all about the animals. If you do a safari in Kenya or Tanzania, part of the trip will involve visiting a tribal village where people are still in colorful traditional garb, but in Botswana, you won't get that. We had a little time to walk around and buy crafts in one small village and there was one touristy town at the end of the trip with some shops and galleries, but otherwise we were quite isolated and hardly saw other people. So don't go if you like to shop a lot, and don't go if you just want to gawk at exotic-looking locals. But on the flip side, the tour guides and lodge staff don't keep their distance-- they sit and talk with you at every meal and hang out by the fire afterwards, so you can actually get to know quite a lot about them. They all spoke excellent English and we learned a lot about the history of the country and what life is like for middle-class Africans, who are somewhat absent from media coverage of the continent. In the end, that was probably of more educational value than visiting a traditional village. 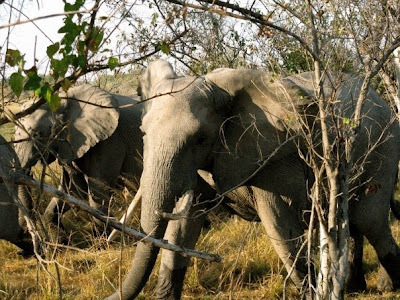 So bottom line, if you've got $9,000 to spend on a fabulous two week experience, a safari is a great way to do it! I'm glad I did it-- pulling the trigger on spending so much was really hard for me, so for once, peer pressure was actually kind of a good thing! But of course I didn't take that kind of spending lightly--to make up for it, this year I'm not traveling at all, except for a relatively inexpensive family reunion trip I have planned for Christmas. There is no rule that says you have to sacrifice all luxuries to keep your financial house in order-- you just have to make the necessary choices to keep your budget in line, and in this case, the trade-off was worth it. Oh, and did you want to see some pictures? :) Here's a few highlights, and I'll just point out that my camera was just a little compact point and shoot, without all that great a zoom lens. Thanks for this post Madame X! I am one of your loyal reader who has been curious about your trip since you mentioned it last year. The post was worth the wait! As I ready your post I felt like I was vicariously experiencing your adventure. Sounds like an amazing once in a lifetime trip. I wanted to this for our honeymoon, but it just wasn't in the budget. How did you get two weeks off??!!?? That sounds like the hardest part! Oh how lovely!!!!! Would you be willing to email me the tour company you went with? I would like the tour information as well. Your pictures look awesome and the experience sounds wonderful. Glad you enjoyed it. Yes include the tour information or email seperately! I am sooo jealous! This post was long overdue but definitely worth the wait. Thank you! I've always wanted to visit some part of Africa, but I knew a safari wasn't my kind of thing. I couldn't imagine sleeping in a tent and doing my business over a pit. The moon and the stars could sing the sweetest melody, but I'd be so distracted by the creepy crawlies, I may end up crapping in my pants! Your pics are beautiful. Thanks again for sharing. Fabulous post and pics, Madame X. Maybe you will consider a career in travel writing. I only got confused once (about 40 being cold) I forgot, you're thinking fahrenheit, and I'm in a celsius country ..... 40 in the tent at night is way too hot to sleep well. Glad you did this, it's something you'll always remember. Thanks so much for finally posting about your holiday. It sounded amazing! 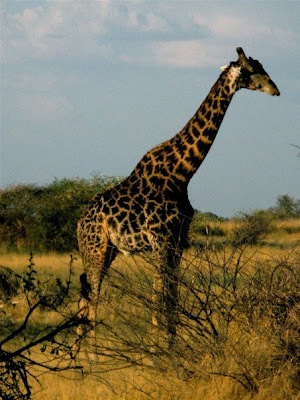 An African safari is at the top of my travel "wish list". I'd also like to know who your tour operator was if you get a chance. It sounds like it was money well spent! Wow...$9k for a vacation! I don't know if I could do that, but the vacation does sound really great. What an amazing experience! Would love to hear which tour company you went with. well, i'm confused about the cost. First you said it was $5900, then later you said $9,000. Which was it? anyway, this was fascinating. Very interesting. Please email me if you want the tour company name, I'd rather not post that here. @Archie, The photos were from my camera and a friend's, actually. Mine is a Casio Exilim and hers was a Canon Powershot. 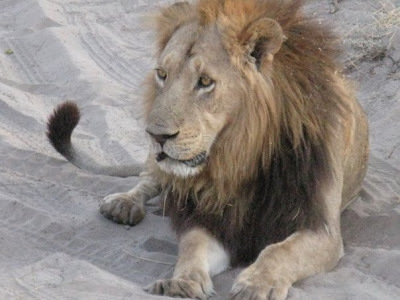 @SingleMa, there are definitely options that involve less camping, but you might sacrifice some of the immediacy of the animal viewing. And there are lots of other interesting countries to go to in Africa! I have a friend who's in Senegal right now, and Namibia also sounds interesting. @anon 9:46, $5900 was the tour company cost, which as I explained included a lot of lodging and meals but not all airfare, etc. when you add in the other expenses I detailed throughout the post the total was over $9000. What an amazing trip! I'm not sure if it's something I'd do (I'd rather have a bit of luxury on a holiday rather than an adventure) but it sure would be an experience. BF wouldn't be able to tolerate the heat, though, and I'd probably be failing at 40 overnight too. I may have been born in the tropics but I can't hack the weather! I love your blog! I've always wanted to go to South Africa. Great pics. Awesome pics! Congrats on your great trip! 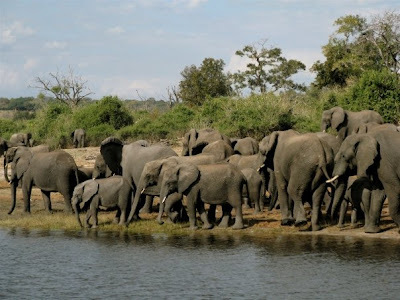 I had the pleasure of doing a Zambia safari trip years ago....because I only had to pay for airfare - all else was "free"! I went to my friend's brother's wedding who owned the company. It was once in a lifetime and I used CCs to pay for it and I don't care. It was worth it. Saving your money for experiences vs material things is totally worth it! So glad you enjoyed it!